Government crackdown means building owners in high earthquake prone areas in the Wellington region will have to tie back unsecured masonry parapets and facades within 12 months. Building and Construction minister Nick Smith announced the new requirement in a speech on government initiatives which are intended to better manage earthquake risks. He said the government has been given seismic advice that, following last year’s Kaikoura earthquake, Wellington, Lower Hutt and Blenheim are currently exposed to eight times the normal risk of a quake. This heightened risk will abate to about twice the norm by year’s end but not to normal levels until 2020. 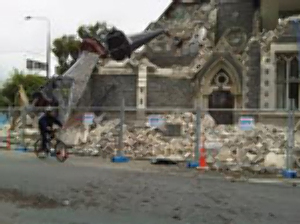 Smith said this meant a scenario is possible, as in Christchurch, where an aftershock occurs in this period close to one of these centres causing significant loss of life. The government is responding to this risk by requiring urgent upgrades of parapets and facades on high risk unreinforced masonry buildings – as such buildings killed 39 people in Christchurch. Smith said relatively minor engineering works at a cost of around $20,000 to $30,000 per building can help mitigate the potential of these parapets and facades to fall. But the government will be helping to fund the work on such buildings and has set aside a fund of $3 million to assist building owners with the cost. The government fund will provide a 50% subsidy for work on buildings up to a maximum grant of $15,000 for a façade and $10,000 for a parapet, Smith said. Local councils will contribute one-third of that grant and the central government will pay the remainder. It is estimated that building owners will have to pay about $4.5 million in total, while local councils will have to contribute $1.5 million. The government is using its powers under the Hurunui/ Kaikoura Earthquake Recovery Act 2016 to enforce the work. But Smith said they are also using those powers to exempt the tie back work from requiring building and resource consents if carried out by a properly qualified engineer. Around 300 buildings in Wellington, Lower Hutt and Blenheim will be affected by the requirement. This includes about 250 buildings around Cuba St and Courtenay Pl in Wellington’s CBD, Riddiford St in Newtown, and about 50 in Lower Hutt. Building owners who are required to carry out the work will be notified by their local council in March.